Announcement Welcome! I specialize in one of a kind landscape and nature postcards featuring outdoor scenes. These handmade quilted fabric postcard art quilts can actually be mailed and when received, they can be framed. A card and gift all in one! These little pieces of art make appreciated hostess gifts for under $20. Need wedding party gifts? These are the perfect solution. Each one can be customized to reflect the recipient's personality. Most of the pieces in the shop are 4" by 6", some are 5" by 7" but I can make any size up to 11" by 14". I love the challenge of a custom order. I can customize using your photo. Gift wrapping and shipping directly to the recipient of the gift is a service I gladly provide. Add a message when ordering or send a conversation through ETSY. * Art Quilting Studio Magazine Summer 2015 issue. The quilted fabric postcards are made by adding layers of fabric to create the design and then stitching each layer. It's a multi step process. Each quilted fabric postcard is individually made. How can a quilted fabric postcard be used? Send as a greeting card for a special occasion or just because. When it is received, it can be framed or rested on an easel and kept forever. Contact me through Etsy or sewupscalequilts [!at] gmail.com. Now accepting payment though PayPal and Direct Checkout on Etsy. Buying handmade is a passion of mine! Welcome! I specialize in one of a kind landscape and nature postcards featuring outdoor scenes. These handmade quilted fabric postcard art quilts can actually be mailed and when received, they can be framed. A card and gift all in one! Beautiful work as always....thank you! I bought two for dear friends of ours, a husband and wife, celebrating birthdays soon. They will love them! 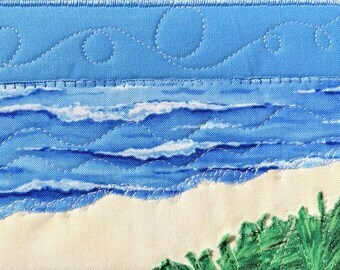 Working on some new beach quilted postcards. 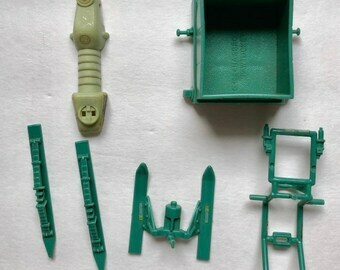 Look at all the little pieces! Article in Sew Somerset about Sew Upscale quilted postcards, a Stampington publication. Newest addition to my store. The rotary cutter squares up the postcards. I draw with the scissors! My fabric, all nice and neat. Do you think I have enough thread? My new sewing machine. My most important tool! Affordable small quilts that can be sent in the mail and kept forever. When I first heard about Etsy, I joined as a buyer and later decided to add a shop. I first sold purses and children's clothing. Since I didn't like the first name I chose, after a few months, I opened a new shop with a new name. Thus, Sew Upscale was born. 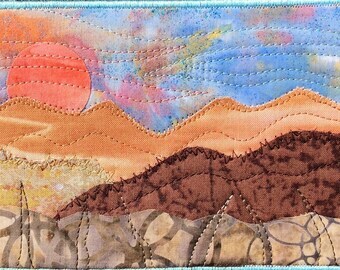 It took awhile for me to find my niche but when I started making the landscape quilted fabric postcards, I knew it was my market. In addition to Etsy, my postcards and are offered for sell at Mountain Made in Asheville, NC and Hamilton Williams Gallery in Morganton, NC. I have made postcards and magnets that are sold in the gift shop at the Texas Quilt Museum for about 5 years. A six page article in the Summer 2015 issue of Art Quilting Studio features my landscape postcards. 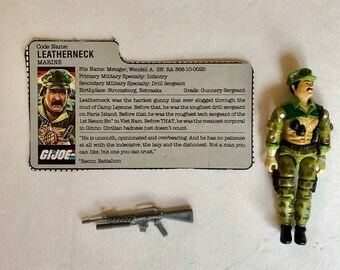 I am a one person operation and everything is handmade by me. I have decided to add some vintage items. Born in Asheville, NC, I now live in Morganton, a small town in western North Carolina. Sewing has been a passion since I was a child. I have an amazing family and have been married for 48 years to Tom Johnson.